Atlanta Ballet’s Ignition program allows the company to shine; not only the dancers, but the artistic team, and the new choreographers that it commissions. The program gives up-and-coming choreographers a chance to create work on a hungry and enthusiastic team of dancers with the strong support of Artistic Director John McFall and his talented team. 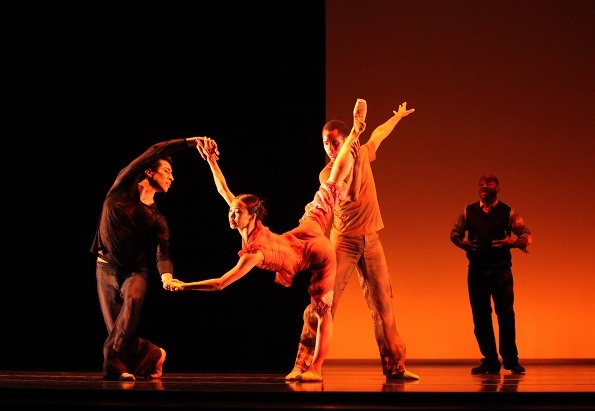 As 2011 Ignition choreographer Gina Patterson revealed, “I really felt completely supported artistically by the Director, John McFall, and the staff. The dancers were really open. I felt like I could go into the piece really deeply and openly and the dancers went there with me wholeheartedly, physically, artistically and emotionally”. 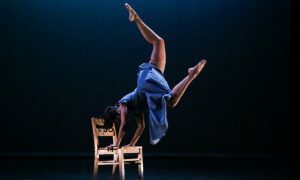 When a choreographer’s vision is supported and nurtured, magic can be created, and that is what we witnessed at Ignition 2011. The evening of performances, danced in the intimate setting of Woodruff Art Centre’s Alliance Theatre, started with Flux, a work developed by young Bennyroyce Royon, a talented graduate from Julliard, New York. The movement was like liquid as the dancers body-rolled, slid across the floor and explored each other’s space. The performers, in pedestrian clothing and dancing in socks looked like average people at first glance until they started to hypnotize us with their intoxicating movement. Royon has a unique choreographic voice and the dancers seemed to revel in his creation. As partners they played with negative space and as groups they danced with strength and power. The men of Atlanta Ballet showed their prowess in compelling group numbers. The music was interesting and took us on the journey with the dancers. At times the music and the movement it inspired got a little repetitive, but that is my only criticism. I enjoyed the unique choreography and the challenge it presented to the Atlanta Ballet dancers, who I had only ever previously seen perform traditional ballets. Quietly Walking, by Gina Patterson was a polished balletic masterpiece. Unlike the other works of the night, which seemed to need a little more time to reach their full potential, Quietly Walking had indeed arrived. It was a complete work, refined from start to finish and showed Atlanta Ballet’s dancers as brilliant technicians and engaging and expressive artists. There were so many special moments. Patterson explored layers of costuming and beautiful fluid choreography that caught our attention and kept it. The work discussed themes of urbanization and deforestation, but it wasn’t all doom and gloom. We experienced the circle of life, death and rebirth and were taken on a breathtaking, yet thought provoking journey. 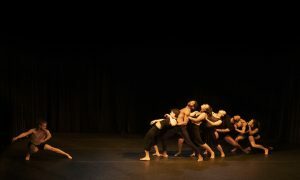 The partner work was exquisite as the dancers showed their vulnerability and seemed to wholeheartedly enjoy the journey. I was taken to another place. Patterson has a gift! Her choreography, and the dancers’ execution of it, together with a beautiful yet simple backdrop of a stark tree branch within a frame, was evocative. Lastly we were treated to Home in 7, the most unique work of the night. Choreographer Amy Seiwert made a bold creation, where she blended live poetry, live music and dance. The company danced to the words of talented poet Marc Bamuthi Joseph as he passionately and rhythmically told tales of Georgia and Atlanta. The poems on their own were engaging, but coupled with dance to express the words spoken, the stories came to life. Violinist Daniel Bernard Roumain accompanied the choreography and his music was an intimate and beautiful response to both Marc and the dancers. Home in 7 was powerful and thoroughly entertaining. Amy Seiwert seemed to be able to find the essence of the words spoken without mimicking them and took us on a journey with the poet. She had such a bold idea, but it was a gamble that paid off. The dancers once again showed us why they are Georgia’s best and Atlanta Ballet as a company impressed us with their courage to try something new. The piece has immense potential and should be toured across Georgia and shown again and again, as a tribute to this great state. Dancers and local US ‘Georgians’ alike couldn’t help but enjoy it. The work was so engaging that I wasn’t ready for it to finish when it did. It seemed to end suddenly to me, and that is my only criticism. Maybe that’s only because I was so engrossed in it? Ignition ignited my personal passion for dance and the arts and was an evening exhibiting artistic collaboration at its best. Congratulations to Atlanta Ballet and the talented choreographers. Top photo: Home in 7 by Atlanta Ballet. Dancers P. Gamino, T. Lee and D. Hansel. Photo by Charlie McCullers.